I first met John "Lucky" Luckadoo a few years back at the Happy Warriors Meeting in Dallas, TX. You might remember that I occasionally reference the Happy Warriors. This is a group of WWII veterans who meet each 4th Friday at The Frontiers of flight Museum at Love Field. A great group of guys made up mostly of Army Air Force veterans and a smattering of Navy, Army and Marine vets as well. They meet for the fellowship and the comradrie. John Luckadoo is the Master of Ceremonies and one of the guys that keeps the group together. John had an amazing career even by WWII flyer standards. He was a member of the first crew from the Bloody 100th Bomb Group to complete a 25 mission combat tour. Flying as co-pilot on a B-17 out of Thorpes-Abbott; with the Dye Crew # 25, they completed their 25th mission on September 16, 1943. 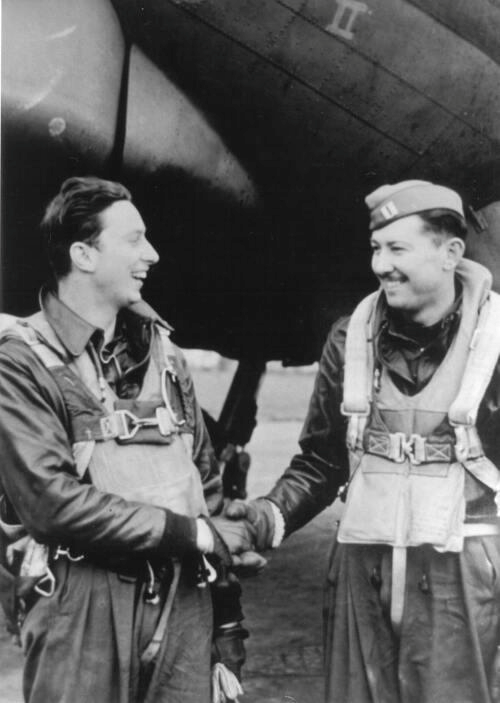 John then went on to become the Operations Officer for both the 350th and the 351st Bomb Squadrons in the 100th. 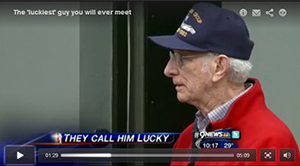 He is the ONLY airman to achieve that distinction in the history of WWII. That's pretty remarkable. John then had one more interesting flight with fate. He ferried the Enola Gay on her second to last flight. She had been in mothballs at the Boneyard in Arizona, the famed final resting place for thousands of military aircraft. The plane was refurbished, (at least enough to fly her cross country) and she eventually ended up at the Smithsonian Institution where she is on permanent display. This past Summer, John returned to Thorpes-Abbott airfield in England. A TV crew accompanied him and they filmed this story. Pretty amazing huh? John is such a humble guy and he thinks he really is the Luckiest Guy in the world. I won't argue with him, I'm glad he made it back to inspire me and countless others with his story. We need more John Luckadoos in this world. I think you'll agree to that.